Mario returns to platforming once more, but is the Mushroom Kingdom beginning to grow stale? The following review of New Super Mario Bros. For the Wii video game console holds the answer to that question. It does contain some spoilers though. You have been warned! After the success of the New Super Mario Bros. DS, it was no surprise that Nintendo would want to continue to cash in on the success of the reinvention of 2D gaming. Mario returns on the Wii once again in what may possibly be his most challenging sidescrolling game to date. The first thing gamers will notice about New Super Mario Bros. Wii is that the game borrows a lot from the art-style of the previous DS installment. That’s not necessary a bad thing considering that New Super Mario Bros. DS was a pretty game. 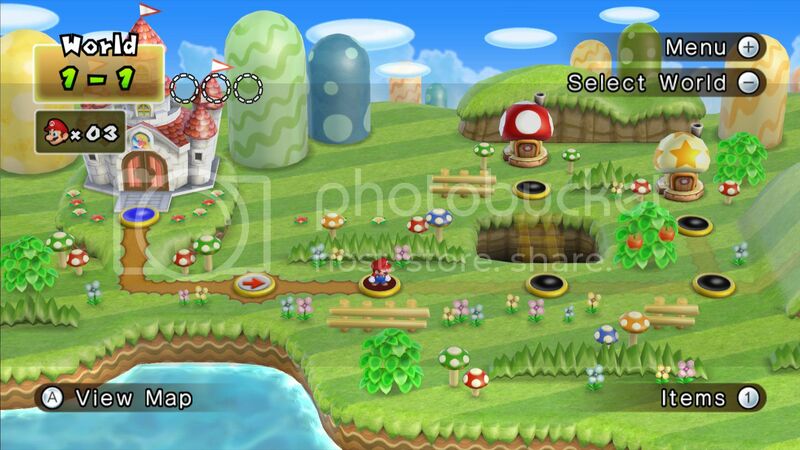 The Wii version does offer up some slight visual enhancements to make it feel more at home on the console. Make no mistake, New Super Mario Bros. Wii is a pretty game. Nintendo also offers up quite a few settings in which the game unfolds. You will see traditional levels with sprawling hills and blocks to winter and desert landscapes to lava pits and more. My own complaint is that in each of the individual World’s, many of the levels use the same backgrounds as previous levels. So you might go from one level to another and notice that the art backgrounds are exactly the same and this happens quite often. This is one of the only areas Nintendo seemed to have skimped on. The same is noticeable in the final castle which does nearly nothing to distinguish itself from the regular castles throughout the game. Even the music is the same. There are two major new features for the New Super Mario Bros. Wii game that helps set this Mario game apart from past Mario titles. The first is the addition of 4-player co-op play which allows you and your friends to play through the entire single player experience with up to 4-players. Players take control of Mario, Luigi and two generic colored Toads. Each character controls exactly the same. Once a player dies, they will reappear in a bubble that another player will have to pop in order to let the player out. Players can choose to enter the bubble at any point in the game if they want some help getting through a difficult area without dying. The coin battle mode introduced in New Super Mario Bros. DS also makes a return. The second feature is the ability to have the game actually play itself. If you’re playing through single player and die 8 times, a Green block will appear in the beginning of the level which you will be able to hit. This causes the game to play itself until you finish the level or decide to take control of the game again. This might sound simply like a cheat but Nintendo wanted to make the new Mario game as accessible as possible to as many gamers as possible. The game borrows heavily from nearly all previous Mario installments. It is packed with Mario nostalgia and even the Airships from Super Mario Brothers 3 make a return. Also making a return are the Mushroom houses which provide various mini games and powerups. The music in New Super Mario Bros. Wii is comprised of both reworked classic tunes from previous Mario games as well as a few new themes and it all sounds as good as you would expect. Many sound effects from previous Mario games also make a return to continue to push Nostalgia on Mario fans everywhere. New Super Mario Bros. Wii doesn’t do a whole lot to reinvent the Mario series but in the end gamers will get a satisfying Mario platforming game and it’s definitely been awhile since we had a true Mario game in classic 2D form appear on a Nintendo console. It’s far from perfect and it could have used a little more polish and a little more care to the level art design but in the end, Mario fans are definitely going to want to pick up a copy of this game. Do you think Super Mario Bros Wii will be the best selling Wii game of all time? With all the hype surrounding this game, I think there is a very good chance. The “New Super Mario Bros” certainly does a great job carrying on the success of it’s legendary NES & SNES predecessors! Both retro gamers and new gamers seem to be happy with it! Why Super Mario Just in Wii,PS2,Nintendo Ds And game cube Not In PSP?? The things i have observed in terms of laptop or computer memory is that there are specs such as SDRAM, DDR or anything else, that must go with the features of the motherboard. If the computer’s motherboard is kind of current and there are no computer OS issues, improving the memory literally usually takes under one hour. It’s one of the easiest laptop upgrade processes one can think about. Thanks for giving your ideas.